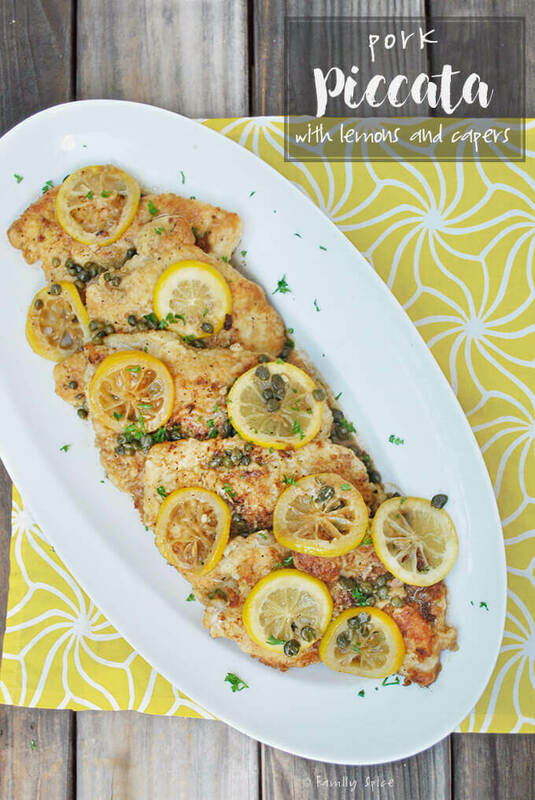 This Pork Piccata with Lemon and Capers dish can feed a big family one delicious meal and on the cheap, too! Works with chicken, too. Finding meals that the whole family will like can be a challenge. So when I do find something that gives me 5-thumbs up, then I quickly add that dish to my weekly rotation. Finding meals that they all love AND economical can be even more challenging. This pork piccata fits both criteria: family and budget friendly. There is some preparation and work involved, but you’ll see it will all be worth it when you see everyone inhale their meal. 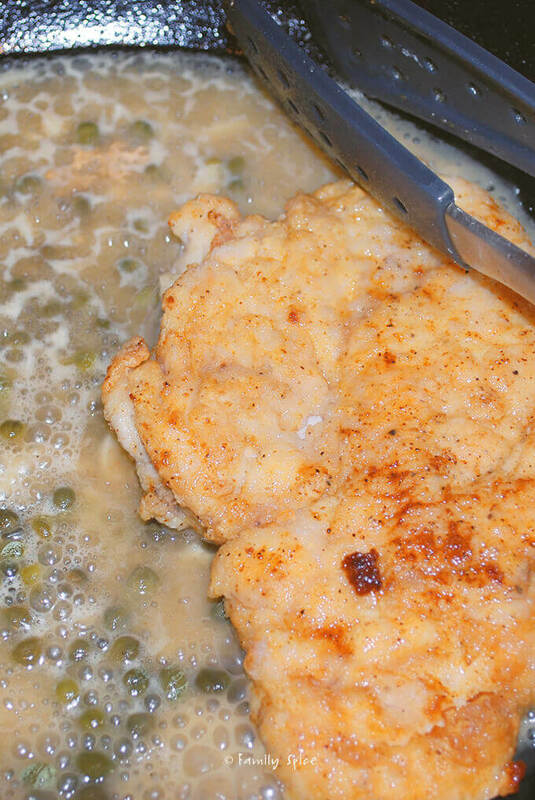 Chicken piccata is more popularly prepared here in the US. Typically chicken breast is cut into medallions and then flattened. Because the meat is then coated in flour and then sautéed. Pork tenderloin or loin chops are a tender cut of the pork and make the perfect choice in pork piccata. My personal preference is to purchase the big 8-9 lb pork loin from Costco that costs around $20. 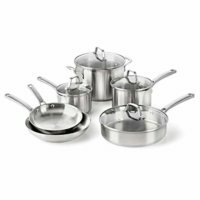 It is such a gonga deal especially for us big families who have to cook on a budget. Then, I cut this massive pork loin into thirds, use my handy-dandy vacuum sealer to vacuum pack it and freeze it for later use. With each third pork loin roast (about 3 lbs each), costing now $6.66, I cut into 8 half-inch pieces for my pork piccata. Now, the meat is costing approximately 83¢ per serving. And this is no small spec of meat, either. The pork loin roast is a great cut of meat, very tender and very flavorful. It’s not as coveted as the more expensive pork tenderloin, but it is still plenty tender and you can’t beat the price. 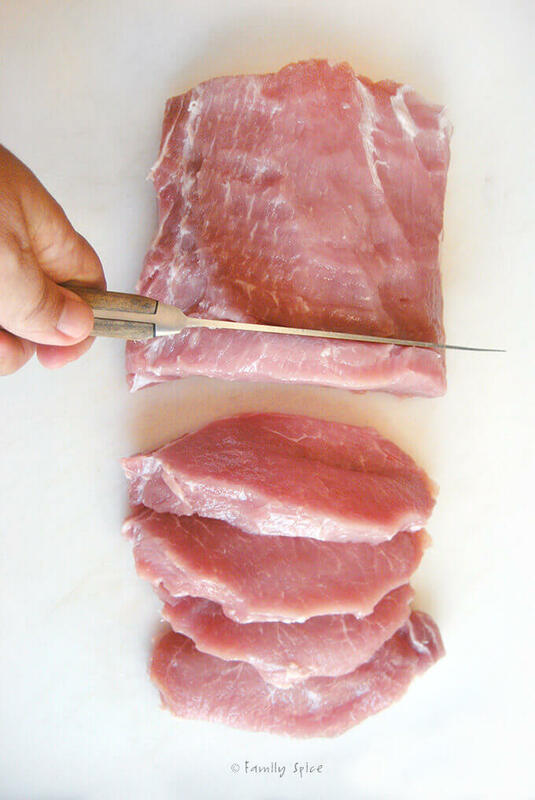 Now, don’t be intimidated when you hear the word “cutlet.” All you are doing is taking your 1/2-inch thick cut of pork loin, covering it with plastic wrap and whacking it with the flat side of your meat mallet. You don’t want to beat it to a second death, otherwise you are shredding your meat. You just want a nice flat piece of meat that’s evenly 1/4-inch thick. This process insures even cooking and also further tenderizes the meat. Now that your pork isn’t so thick, it will cook quicker and will still remain moist and tender. Season your pork with salt and pepper, and coat with the seasoned flour. You will sauté each cutlet in a hot pan with oil for a couple minutes on each side and then reserve the browned cutlets in your serving dish while you prepare the sauce. Once all of the meat has been browned and reserved, you are ready for the piccata sauce. 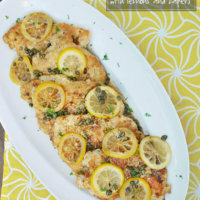 Whether you are making piccata with pork, chicken, veal or tofu, the sauce remains the same. 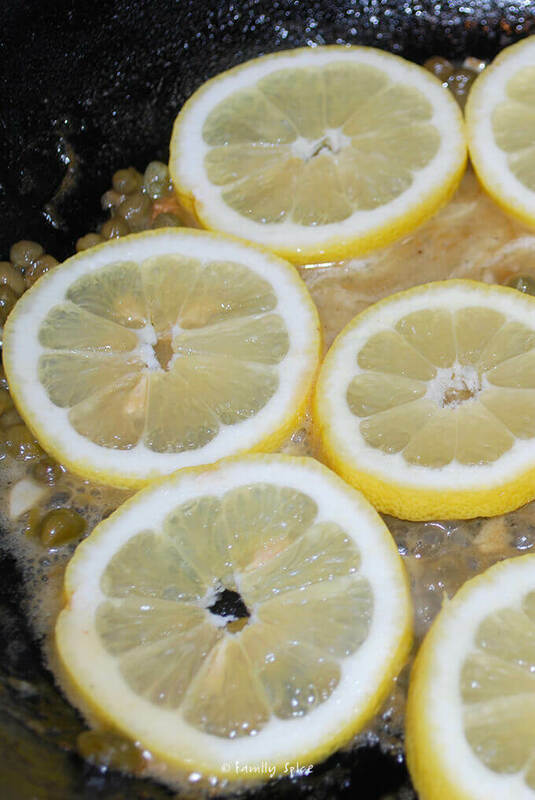 For my piccata sauce, I use white wine (2-buck-chuck works great), garlic, chicken broth, lemon juice and capers. The sauce starts to bubbly and thicken with the flour remnants in the pan. You finish the sauce off with a little butter for creaminess. Return your browned pork cutlets to the pan and cover with the sauce and top with lemon slices and continue cooking until pork is done cooking. Dinner is ready. I love serving this dish with asparagus or broccoli, or any other veggie that is in season and of course, on sale. For a starch, of course you can some linguine, fluffy rice or even mashed potatoes. So don’t let the economy get you down. If you are not a Costco or Sam’s club member, your local grocery store and smaller markets are always having sales on chicken breast and pork tenderloins. The key to being a smart shopper, is to do a little research and to stock up when those gonga deals show up. Lucky for me, I have a wonderful lemon tree that loves to provide my lemon loving family lots of lemons. When I don’t have lemons on hand, I hit my middle eastern market for cheap produce. That’s also where I get capers for cheap, too! Bargain friendly gourmet food that the whole family loves – I’m all over that! Don’t eat pork? Remember, you can make this dish with chicken breasts, too. 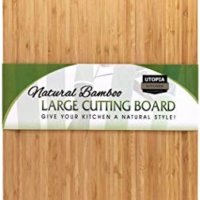 Slice pork loin across the grain, into approximately 8 half-inch thick pieces. Places slice of pork, one at a time, between two sheets of plastic wrap. 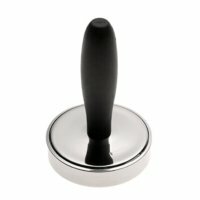 Evenly pound meat with a meat tenderizer mallet using gentle taps with the flat end of the mallet until 1/4-inch thick. Season both sides of the pork cutlets with 1 tsp salt, 1/2 tsp black pepper. In a small plate combine flour, 1/2 tsp salt and 1/4 tsp lemon pepper. Press pork cutlets into flour mixture until thoroughly covered. Shake off excess flour and reserve. In a large skillet, over medium-high heat add olive oil. Sauté 4 cutlets for 3 minutes on one side, flip over and sauté the other side for 2 minutes. Remove cutlets to serving dish, cover with foil. Sauté remaining cutlets and repeat steps 8 & 9. Deglaze pan with wine and garlic. Using a wooden spoon, scrape up browned bits from bottom of the pan and cook for approximately 2 minutes until garlic is golden. Stir in broth, lemon juice and capers. Return cutlets into pan and cook on each side for 1 minute. Transfer back to serving dish, covered with foil. Finish sauce by adding butter and lemon slices. Once butter melts, pour sauce over cutlets and serve. Cooking Tips: You can also make this dish using chicken breast or turkey breast. For chicken breast, flatten each breast-half using a mallet. 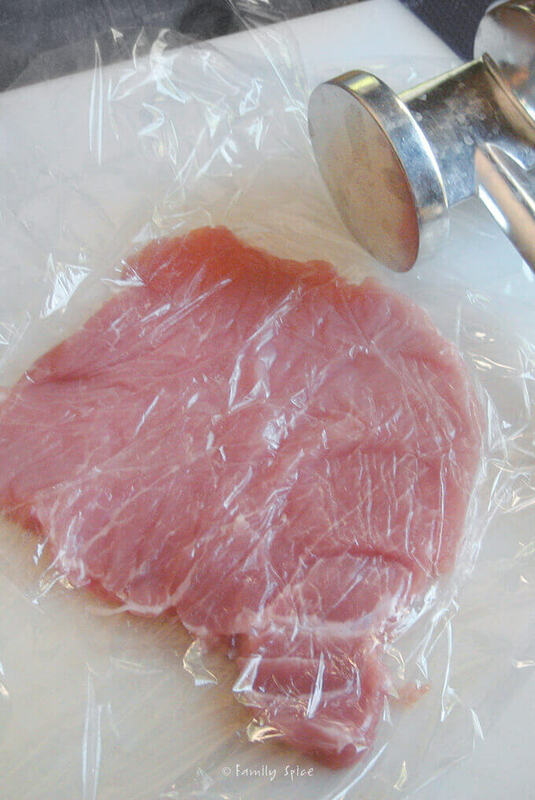 For the turkey breast, cut 1/2-inch slices on the bias (diagonal) to keep slices intact when flattened. Serve with pasta, potatoes or a crusty bread. Made this for my family a couple nights ago and got rave reviews! It was very easy to make and my cooking with pork dry spell has ended! The tangy lemony flavor was a huge hit with the kids as mine enjoy sucking on lemons meant for garnish (weird, I know). 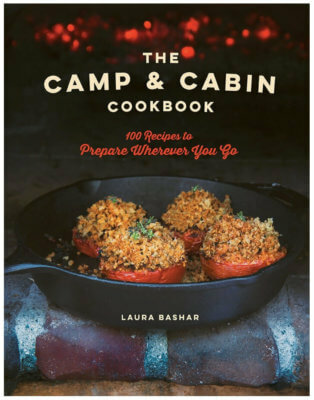 Definitely adding to our dinner repertoire! Family Spice ROCKS!